Not much progress was made on the house remodel while we were away. They had some AC placement issues to resolve. We are currently finalizing our electrical plans. 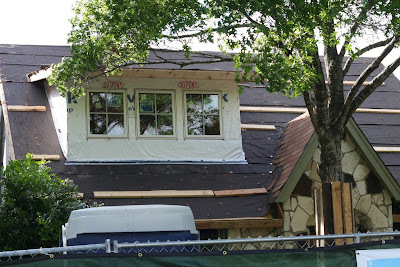 Once the outside electric issues are resolved they can finish the siding and add the shingles to the roof. That will feel like progress. 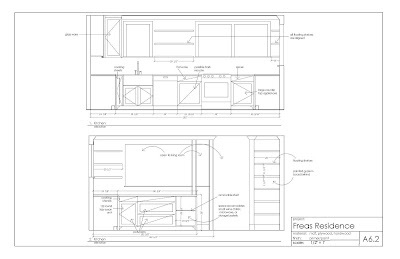 Meanwhile, here is our latest kitchen design. 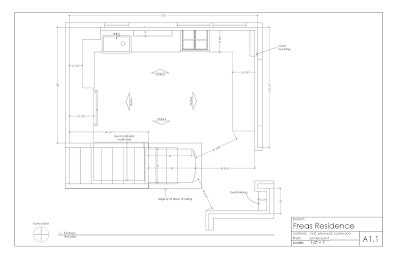 North wall with farm house sink and stove under windows. 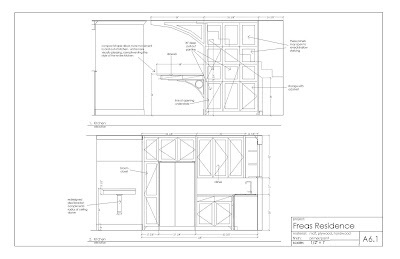 East Wall with pass through to front den and space in lower cabinetry for wine fridge (high priority). I'm still unsure if we should have open floating shelving on these two walls or regular upper cabinets. South wall with island open to casual dining room and three pull out pantries to make use of the space under the stairs. I like how he put paneling along the rest of the wall to look like additional cabinetry. West wall with refrigerator and closed upper cabinetry. We reluctantly decided against glass fronts so we could have more storage and hide the microwave. I'm still not sure I want to give up cabinet space for the microwave, but it seems better than having it on the counter top or giving up other lower cabinet space. 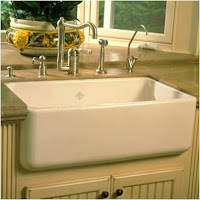 I love our new farm house sink. Overall I like how it is coming together. Lily, Evan and Will in the tub for bathtime, one of our favorite times of day. We picked out a larger 5 1/2 ft tub for their new bathroom so that there will be room for Holden too. 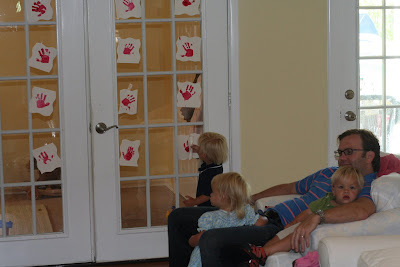 The day we left for our trip was playschool day so they barely noticed as we said our goodbyes. We missed the prior week's dino class due to our tooth emergency/undiagnosed group vomitting episode. I went ahead and gave them their plastic dinos on their trays with appropriate dinner - dino shapped chicken nuggets and broccoli trees. Anyway, last week Jessica planned reptile activities. She brought a large bucket of dirt and buried alligators and other creatures that they could discover. 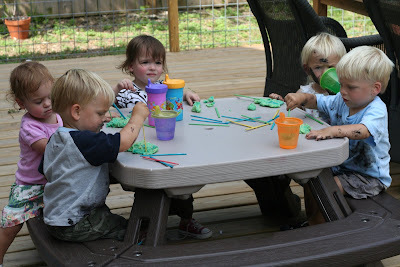 Here they are playing with play dough and adding sticks for legs. They are covered in black from painting lady bugs on red paper. This week's topic was 'The Beach' so they dug in the sand for sea creatures, painted 'gak' (they used markers to dot this goopy fun substance that Jessica made, resulting in streaks of color), and played on the splash mat. 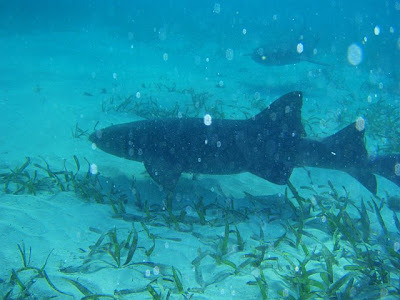 Belize was a nice reprive, a perfect trip to recharge. Even the flight down felt rejuvenating. David travels so much that we got bumped up to first class. They served seared scalops on a goat cheese risoto with cold white wine. I leisurely read a book for the first time since Holden was born - decadent. Ususally, I can't wait to get to my destination. This time I would have been content for the plane to take another lap. We spent the first couple days just unwinding and actively trying to do nothing. One of the highlights was an hour long massage in a grass hut on an ocean dock. We could hear the waves lapping while we were slathered in aromatherapy and they worked out our numerous kinks from picking up kids and toys. As more wedding guest arrived we spent our time hanging out with friends and staying up too late. 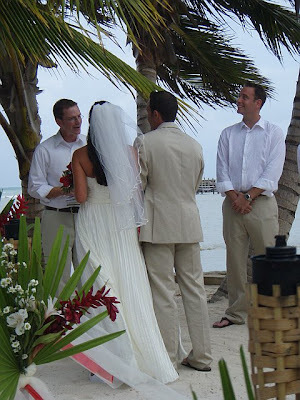 The wedding ceremony was perfect, right on the beach. They exchanged vows under palm trees with the tranquil ocean behind them, followed by a simple reception al fresco at the ocean side restaurant. 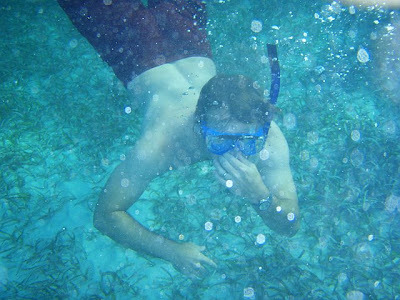 Sunday we went diving and snorkeling to soak up the bountiful aquatic life. 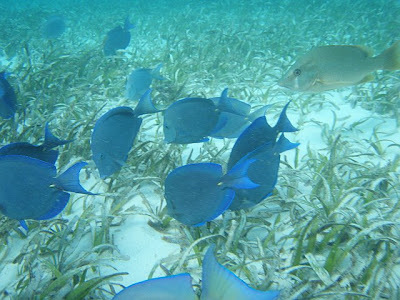 We saw huge colorful pelican fish, schools of electric blue fish, reef sharks, spotted rays and David saw some large sea turtles. We called home several nights to talk to the kids. They would tell us, 'haloo moomee dada, nigh nigh'. By Monday we were really ready to get back home to our family. The kids seemed to have had a good time with their grandparents. They were very happy, not too tramatized by our absence, although Will did ask for us a lot while we were away. My mom took Holden to his four month appointment for me today so I could pack. The doctor thinks he is just perfect, we do too. These days Holden is on the move. He is getting up on all four and rocking and doing a bit of backwards crawling. He can roll over and pivot. He is quick to smile and is makes lots of sweet sounds and raspberries. He has the prettiest skin, like peaches and cream, nothing like my olive skin, and his hair is getting very blond. I'm off to bed. Goodnight. 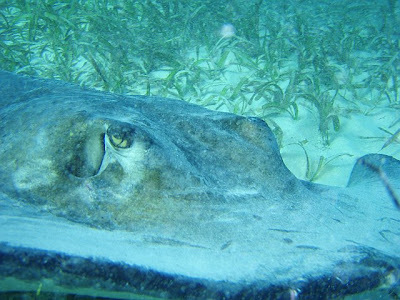 I'll post again when we return from Belize. 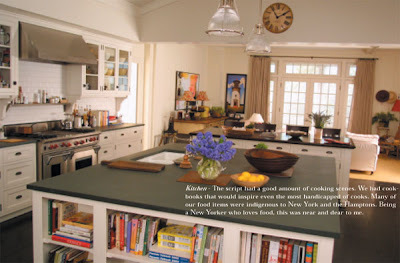 Apparently tons of people out there are enamoured with this kitchen from Something's Gotta Give. I've seen it referenced on several design blogs recently even though that movie came out several years ago. I found this 'How to' on this very kitchen on a All Things Blue. How timely. I'm always searching for ways to add fun to our week but keep things simple. 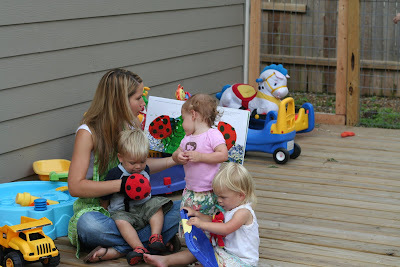 Friday afternoons I like to have friends over to hang out and have a glass of wine while we watch our kids play. It's easy to serve an picnic dinner followed by 'bath time' in the baby pool. At the end of the day the kids are happy, fed and clean, ready for bed and it's a nice change of pace from our normal daily routine. I feel like overall we have it together, but just barely. It doesn't take much to tip us over the edge and then chaos ensues. Last week was particularly rough. Tuesday night during bath time Evan was splashing and having fun, I let my guard down and in a flash he fell and chipped three teeth on the cast iron tub. A few minutes later Will began vomiting, then Lily. Everyone was crying, including Holden. Luckily my mom was here but we still needed back up so I and called our wonderful neighbor Melanie over. She was such a saint, holding Lily even though she was covered in vomit and helping clean up. Now that is a good neighbor. I was physically and mentally exhausted and called an emergency home day the following day so we could catch our breath and get things in order. David took Evan to the dentist and we did a bunch of things that we really need to do but have been putting off because we are always too busy. It was just enough to get us back to that very delicate balance. Even with lots of help of family and friends it is a crazy pace week after week. It's hard to get a moment of peace and clear our minds. 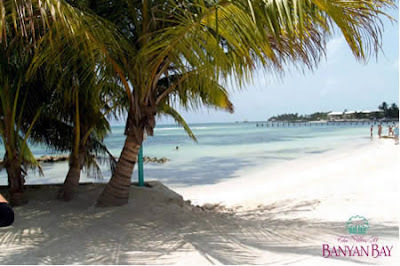 Next week we are going to Belize for a wedding and R&R. I'm a little worried about leaving the kids for six days. It's tough because they are too young to prepare them and explain where we are and when we will be coming back. But they will be in good hands with their grandparents and we desperately need a break. We are looking forward to celebrating with our friends and lounging by the aqua blue ocean. But we are also looking forward to the simple things...like eating breakfast while sitting down, having a cup of coffee without worrying about someone spilling it, getting a chance to read a book and taking a nap whenever we please. My mom is helping us eat healthy while she is here. It's really nice to have some help chopping veggies and preparing quick healthy snacks, especially these days when I barely have time to think and still have baby weight to shed. I feel better and I've been noticing a beneficial side effect. 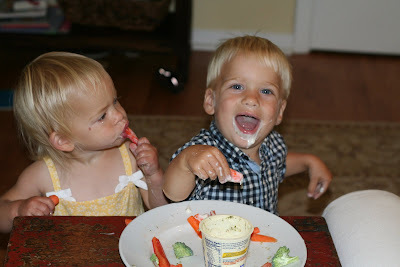 The kids want to eat what ever we are eating. So when we eat well they eat well. My good habits turn into their good habits. It's another reminder to take care of myself. Not just because I need it but also because when I take good care of myself I set a good example for my kids to take good care of the themselves. Evan is very interested in Holden, he calls him 'Hold-ee' with the emphasis on the 'ee'. Lily is still the mamasita, very affectionate giving him lots of kisses and hugs. Will adores Holden too but he is a snuggle bug, which I love, and it is hard on him to have to share my lap time with the baby. This the first chance I've had to sit down and post some photos from Mother's day. I have just a minute...I can already here the trio awake in their cribs talking and giggling. They can usually entertain each other for about ten minutes before mutiny. If I had more time I'd write about how I waited so long to be a mom and how much I enjoy being a mom. But I need to go get the kids and I'm way to tired to write anything eloquent. So I'll just give a shout out to all you mother's out there. Hope you had a lovely Mother's day like mine. 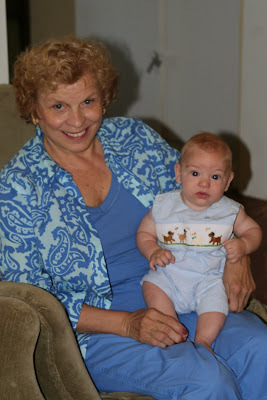 My mom GG and baby Holden. 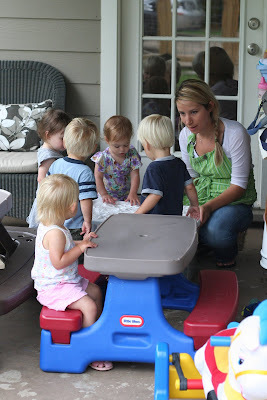 Today was the first day of the Freas-White playschool. Jenny will be bringing her twin girls Harper and Lucy to our house on Wednesdays for playtime led by their darling nanny Jessica. 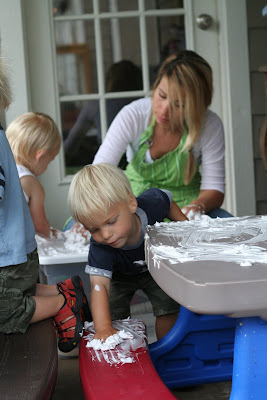 Jessica is a preschool teacher and has tons of creative ideas perfect for our toddlers. She has put together 'lesson plans' for the next four weeks. The subject for today was babies and family. 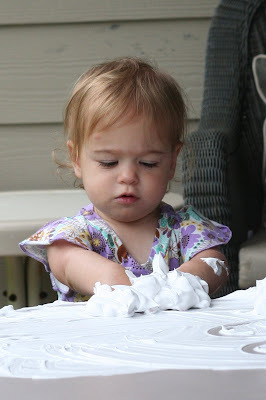 When I headed out to work they were playing with a box with baby pictures pasted all over it, then covered with shaving cream. 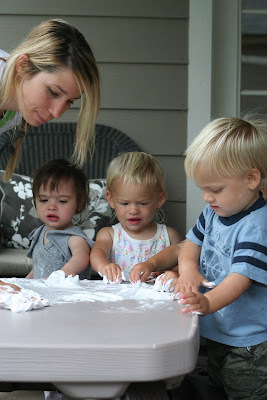 They were uncovering and discovering the babies, drawing B's in the shaving cream, generally making a mess and having a blast. 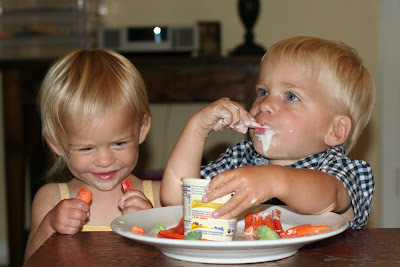 The next activity was caring for babies...feeding baby dolls baby food and giving them a bath in a small tub. It's going to be a refreshing injection of creativity into their week. And I'm looking forward to having new ideas to interact and play with them. Can't wait to hear more about their day...and see my mom! Gramma G is arriving today and will be staying with us for a month. 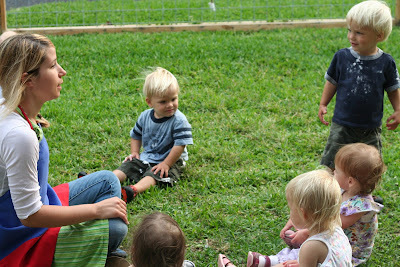 She is going to be amazed how much they have grown and how much Will, Evan and Lily are 'talking'. 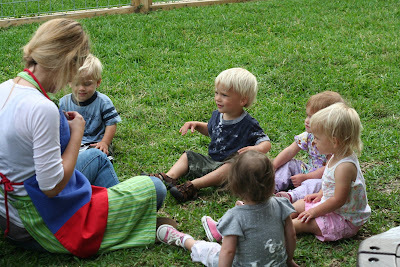 Circle time. Jenny said Evan is more 'kinetic'. Translation, he doesn't like to sit still. Jessica manged to get all to sit and listen, at least a moment. Afterwards Will, Evan and Lily slept for more than three hours. I wonder if Jessica did too. Next week: Dinosaurs. Stay posted. I heard Holden laugh for the first time today! His sweet giggles are delightful. 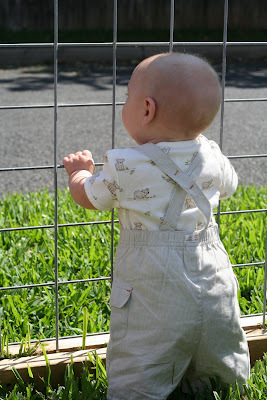 It is fun to think of all the exciting first year stages we get to experience all over again - first laughs, solid foods, crawling, sitting up, first words, first steps. I am getting a bit better about slowing down and soaking it all in, enjoying the moment. It's tough, our life is so full. It's rich but intense. When they are all trying to get in my lap while I'm nursing Holden it can be hard to enjoy their affection. But I'm aware that the day will come all too fast when they won't want to cuddle with us anymore. So until then I'll try to enjoy it. 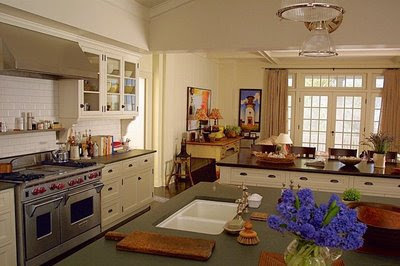 I've always adored this kitchen from the fabulous house in 'Something's Gotta Give'. Inspired by this kitchen we have included white painted cabinetry, honed black granite and white subway tile backsplash in our plans. Here is another of my favorites also in black & white by Houston designer Lisa Rowe (photo from Cottage Living). We selected our granite slabs today which is making it all start to feel real. I've been back at work part time for the last couple of weeks. It is incredibly quiet at work and I can drink my coffee at my desk without three little people trying to sit in my lap and vying for a sip. How decadent. My projects are not too taxing - yet - so I've been able to ease back into the working world. David travelled all last week for work and didn't get home until late on Saturday. He is headed back out to San Diego tonight so he worked from home a bit today. 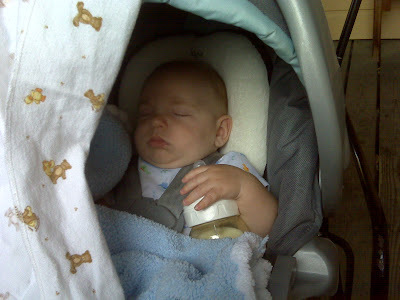 While I headed into the office this morning Holden hung out with David at Pacha for their peaceful latte break. David and all of our kids have blue eyes. It doesn't look like any of them will turn to swamp green like mine. Both of my parents have blue eyes so I guess it is not that much of a surprise. 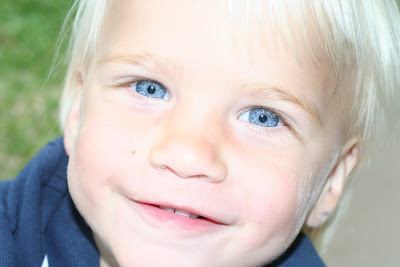 They each have different color blue eyes, with Evan's being the lightest and brightest. Lily's are more grey-blue and Will's are a bit darker like David's. Holden's eyes are still mostly infant blueberry blue but are getting lighter every day. I'm going to post photos of each of their eyes, because I'm their mom and I think they are beautiful. 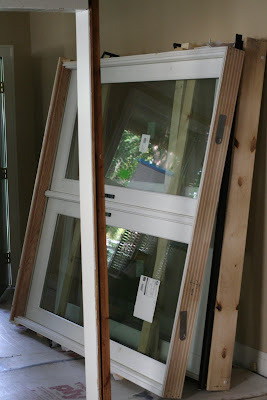 Our windows have arrived and they are beautiful. French doors for the dining room and master bedroom. These days Lily is into doing things herself. She wants to climb into her own highchair, put on her clothes and shoes. 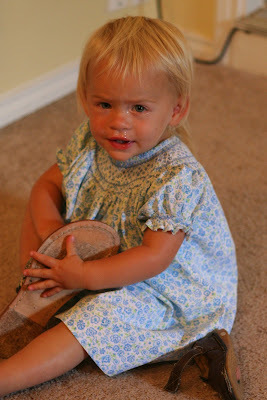 She spent half an afternoon the other day practicing putting on everyones shoes and now she is now pretty good at it. If you try to help she will say Noooooooo! and give you this look. 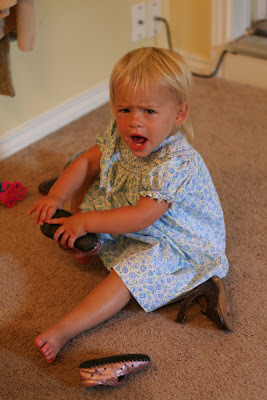 The tears are just left over from when I put on her dress that she didn't want to wear. She was mad as a hornet but I didn't give in. I have one girl and am going to milk it.